This is a popular dessert pear with a fine flavour which was introduced from France in 1849. Pears flower two to four weeks before apples and need slightly warmer conditions. `Doyenne du Comice`ideally should be picked in October while still firm and stored until November before eating. 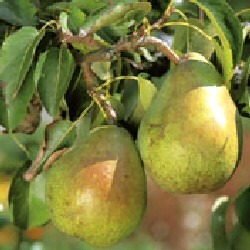 Self-fertile/Not self-fertile: This pear is not self-fertile so it is necessary to have another pear for pollination. Concorde Pear is a great pollination partner for Doyenne De Commice.